Korean, Italian, & Polish editions. 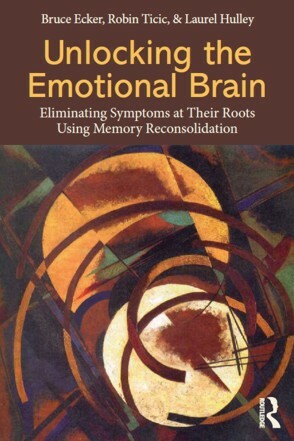 "Unlocking the Emotional Brain is destined to be a landmark publication….I'm sensing an emerging consensus in the field of psychotherapy….I think memory reconsolidation and this book could be the hub around which the various approaches unite.…It is essential reading for therapists of all stripes…"
Coherence Therapy, formerly known as Depth Oriented Brief Therapy, is a system of experiential, empathic psychotherapy that enables therapists to consistently foster deep, lasting shifts, dispelling clients’ symptoms at their emotional roots often in a relatively small number of sessions. The steps of Coherence Therapy carry out the process of memory reconsolidation identified by brain researchers. Understanding reconsolidation shows us exactly what gives new therapeutic experiences the potency to actually replace and erase entrenched, unwanted behaviors, beliefs and states of mind. interview Is It Always About Attachment? No, it isn't, as Bruce Ecker explains to Psychotherapy Networker editor Rich Simon in this lively interview, and he paints a vivid picture of how therapists can determine accurately whether attachment issues underlie a given client's problem patterns. To see just a few excerpts from the full interview, click here. For the full interview, including two Coherence Therapy case examples, click here. interview Online Interview: Bruce Ecker on Reconsolidation and Coherence Therapy The Mental Help Net website's second interview of Bruce Ecker focuses on neuroscientists' breakthrough research on reconsolidation, with big implications for psychotherapy. For podcast and transcript, click here. For the previous interview, which looks closely at how profound change of emotional and behavioral responses takes place, click here. research Press Release: Psychotherapists and Neuroscientists Independently Discover... After a breakthrough demonstration of reconsolidation was reported by neuroscientists in the research journal Nature, a related press release from the Coherence Psychology Institute began, "A process identified by psychotherapists in their therapy sessions, and subsequently discovered independently by neuroscientists in lab studies with animals, has now been used by neuroscientists to erase a fear reaction in human subjects. ..." To read more, click here. FAQ Reconsolidation FAQ This FAQ page addresses everything you ever wanted to clear up about how reconsolidation works and how the process now identified by neuroscientists for dispelling emotional conditioning through reconsolidation is the heart of the methodology of Coherence Therapy. Click here. to fill your order or subscription. REFUND POLICY For goods: If you are not satisfied with your purchase, you can return your order for a full refund. You can return your purchase for 90 days from the purchase date. For services: Fees paid for training services received are non-refundable. "Coherence Therapy," "Coherence Psychology," "Therapeutic Reconsolidation Process" and "Emotional Coherence Framework" are trademarks and/or service marks of the Coherence Psychology Institute, LLC.